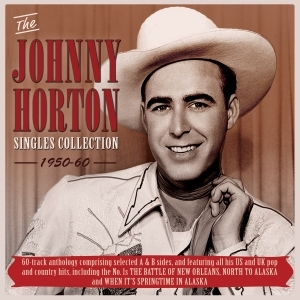 Johnny Horton was a honky-tonk country and rockabilly singer, who found international fame and chart when he recorded a run of “saga” songs which crossed over into the pop charts in the US and UK in the late ‘50s into 1960, including “The Battle of New Orleans”, “Sink The Bismarck” and “North To Alaska”. Having actually gone to Alaska to search for gold in 1948, he got into country music via talent shows and had his own radio show as “The Singing Fisherman”, making his first records in 1962, recording over the years for the Cormac, Abbott, Mercury and Columbia labels. After his first country hit in 1956 with “Honky Tonk Man” had a run of hits including a country No. 1 in 1959 with “When It’s Springtime In Alaska”, followed by his pop breakthrough with “The Battle Of New Orleans”. Having made the transition from being a down-home country singer, through the ranks of emerging rockabilly performers into the pop world, he was just about at the height of his fame when he was tragically killed in a car accident in 1960. This great-value 60-track 2-CD set, comprises A and B side from across his career with at least one side of all of his releases included, and it naturally features all of his country and pop chart successes, so it’s a comprehensive overview of his work.